What’s to become of the shopping mall? On a recent trip to the the US, a couple of colleagues and myself went to a nearby shopping mall in an attempt to get some lunch. Without doubt, it was one of the most depressing experiences I have had for a long time. Of the three main ‘anchor’ department stores, all were going through the motions of final sales, as two were held by companies that were being closed down completely and the other was about to close due to parent ‘restructuring’ – translation, there was another store in a nearby mall and not enough business for both. Of the remaining 80 or so retail units, only 20 were open and of these, three were ‘pop-up’ craft shops, the rest were a mix of unknown apparel and sports goods stores and a couple of food and coffee outlets. The only people in the mall were of retirement age and congregated around tables in the food outlets, talking or playing dominoes. It is located in a middle class suburb very close to one of America’s major cities, so it’s not as if the catchment area is impoverished. It caused me to muse on the likely future of these once great edifices to the American dream. 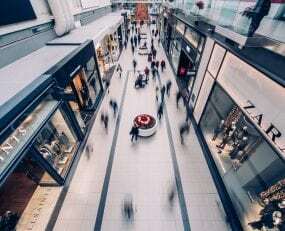 More to the point, what is the outlook for established shopping malls generally, as the spread of e-commerce has disrupted the retail shopping landscape globally? Given the ability to buy products almost anywhere via the internet, the necessity to visit a store in order to buy something has reduced considerably. In the past, mail order catalogue companies provided a similar service, but this aspect of the general retail picture was a small percentage of the overall retail landscape. There have been numerous surveys and reports as to how and why e-commerce has established such a stranglehold on the shopping experience and I have no wish to repeat them. But it is very clear that the way the retail ‘conversation’ with the customer took place has gone for good. How many of us now go to retail shops to have a physical interaction with a product, compare the in-store price with the online price, and then place the order online? In many cases, myself included, the only time I buy in a store is either on impulse, or because I simply cannot wait for a delivery in the following few days. This fundamental challenge to the retail model must inform the future design of shopping malls. I believe that they must provide a reason for potential customers to go to them and it must present a compelling experience, over and above anything that technology may be able to deliver to them in their own homes. The physical layout of the malls themselves must reflect the variety of different vendors that might be interested in interacting with potential (or existing) customers in a specific location. Many major brands are rethinking how they offer their products to customers. This also has implications for their supply chain and fulfilment processes. Inditex S.A., the parent of Zara, recently announced that they are exploring the use of existing stores as mini fulfilment centres or DC’s. This strategy allows them to fulfil customer orders from the closest store, in the event the item is not available in a central DC. If a customer visits a store and a particular item is not available, the store can find any other store where it is available and have it shipped directly to the customers address from the other store. While this may seem an obvious and useful process, do not underestimate the complexity of the inventory management systems required to make this happen. It also impacts the layout of the stores as more space is required for the fulfilment activities, reducing the amount of retail space available in any given unit. But for retailers locked into long leases with landlords, it may be a path to more profitable operations. In many malls, there has been a sharp increase in so called ‘pop-up’ retailers. It’s a way for the mall operation to rent unused stores, albeit for a short period. The run up to Christmas is an especially active time. My suspicion is that this business model will become the norm, as retailers are now very wary of any kind of long term retail property commitments. Therefore mall operators should consider rethinking how a mall is designed and how it operates. I believe that malls will need to be designed to be completely reconfigurable, probably within hours or a least a couple of days. They should be able to accommodate any kind of business to consumer experience and at the same time, be capable of hosting complimentary partners and experiences. Some of the massive malls found in Asia or the UAE have examples of this where they have partnered with major brands (such as Ferrari) to extend the customer experience beyond just shopping. Reconfigurable units are not new, as hotels have had their conference facilities designed in this way for years. Some new hospitals have borrowed this approach to reconfigure their operating suites and intensive care units. They have movable walls, state of the art communications, flexible lighting and sophisticated air conditioning infrastructure, enabling them to cope with almost any kind of requirement. Related processes for cleaning, maintenance and repair have all been upgraded to cope with such a variable landscape, with the sole aim being to provide the capability in first class condition on a 24/7 basis, reconfigurable based on demand. The related logistics infrastructure will also look rather different, with probably a smaller number of parking spaces, due to the increasing use of autonomous taxi and ride sharing journeys. But the requirement for more frequent deliveries will mean changes to the storage areas and greater use cross docking. If customisation of garments produced using local ‘sewbots’ and 3D printing continues to grow, dedicated collection and delivery points will need to be expanded. These are just some of the areas they might change is my assumptions are roughly correct. It is clear that over the past ten years consumer behaviour has changed in many unexpected ways. Primarily this has been as a result of online access to products. Many manufacturers and retailers have responded by trying to change how they can adapt within their existing business processes. They have probably reached the limit of what is capable and efficient and so any further evolution will require more fundamental change. In the same way that companies can now obtain information services via a standardised on-demand business proposition, brands and retailers will be seeking similar facilities for customer engagement.